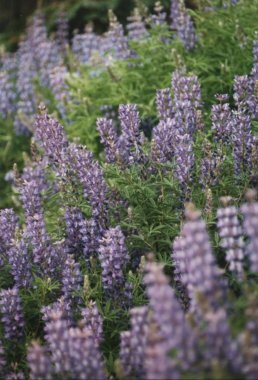 Lupine are members of the pea family. There are 23 species of lupine in Arizona and they can be found in nearly every habitat in the Sonoran Desert region. Lupine can be identified by their palm shaped leaves (which contain 7 to 9 leaflets) and flowering spikes which grow to about a foot tall. The leaves move to track the progress of the sun across the sky during the day and fold up at night. The flowers are pea-shaped and typically purple, but some species tend towards blue or pink. The seeds of lupine are eaten by birds. Lupine is Latin for wolf. The plant received its name because it was once thought to rob the soil of nutrients. In fact the root nodules help enrich the soil through nitrogen fixation.